Gabriel Garcia Moreno - President of Ecuador - Awesome History Book! Gabriel Garcia Moreno was the greatest Catholic statesman in Ecuador history. He was eulogized by Pope Pius IX as a martyr. He lived from 1821 to 1875 and was elected President of Ecuador twice: first from 1859 to 1865 and second from 1869 to 1875. His story has given me many insights into our own United States "American History". In the end he died as martyr for the Catholic religion and his dear country in August of 1875 just after he was elected to his third term as the Ecuador President. The book Garcia Moreno is another rare Catholic book amongst many that publishers are reprinting for our benefit in these days, and it is the best story of Ecuador's history. Thank you Dolorosa Press for reprinting this book. We devoured it! Pure enjoyment: The underdog conquers his faults, rises to heroism, and wins the eternal battle. This is an especially good Catholic history book. A priest, Rev. Fr. Augustine Berthe, went to the cities in Ecuador where Garcia Moreno had lived and worked. He followed the phenomenal story of Moreno's efforts to lead his people against several Marxist revolutions to a peaceful Catholic life amidst the revolutionary countries that surrounded the country of Ecuador. Fr. Berthe tells the story that the Ecuadorian provinces faced not only the destruction common to revolutions, but also the chaos of bandits who had been displaced from their homes. He also told about the Indians who had been unjustly treated by the Protestant sects. Moreno's rule eventually guided the Ecuadorian government toward peacefully enforcing the Catholic Ten Commandments. It came at a very great price, yet with very great reward for him and his people. The Ecuador government had been held by revolutionaries and was rife with evil as Moreno faced the task of restoring his country. The book is told from a factual and historical perspective that does not sink to false chivalry, dialog presentation, denigration of women or other classes of people. Fr. Berthe gives a detailed Ecuador history before he starts Moreno's story which builds the scene that sets the stage for Moreno's heroism. I treasure that Fr. Berthe interviewed the local people who had been living at the time when Moreno lived. What I love is that this is a simple retelling of what happened. No opinion or agenda necessary and none given. Many search for the best books for boys, some books to inspire young men. If this is you, start right here. Also, ladies and gentlemen will both appreciate the fast action story of this great martyr for the Catholic Faith, who was equal to any of our true Catholic kings and Catholic knights. The author, Fr. Berthe, describes the geography of Ecuador throughout the book giving a glimpse into Ecuador's provinces, but most especially those of Quito, Guayaquil, Vilcabamba, and Ibarra Ecuador. 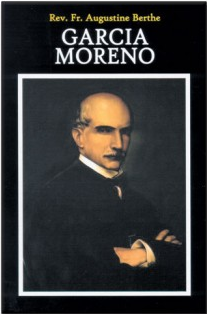 You'll learn the lay of the land with this book as you follow Moreno through his many duties. Fr. Berthe describes the many times that Gabriel Garcia Moreno and his armies traveled the plains, jungles, and mountains back and forth across the Ecuador map - on foot. The mountains are as rough as those in our Rocky Mountain Range through the United States of America. The most surprising Ecuador facts that we learned were the vast ranges that the men during the late 1800's traversed on horse and foot, and their huge successes in battle. Also, the illustrations throughout the book are very inviting. Why Study Ecuador History & Gabriel Garcia Moreno? Short answer? Ecuador's history parallels our own United States history and that of most modern nations. One leader like Moreno could repair much in our own country and in others. Long story? The most charming story during the history of Ecuador is the story of Venerable Mother Mariana de Jesus Torres placed on the Ecuador map in Quito. Fr. Berthe tells the story about the apparition of Our Lady of Good Success, Our Lady of Quito, who foretold that a Catholic statesman would consecrate the Republic of Ecuador to the Sacred Heart of Jesus. The story is uncanny as it unfolds, especially since Ecuador was not yet a Republic. Dolorosa Press reprinted this most interesting old Catholic book with a Preface that places the actions of Our Lady and Gabriel Garcia Moreno in the context of Ecuador's history and our own current history. Dolorosa Press even has current photos of Quito's Cathedral and the Plaza de la Indepencia, the convent of the sisters, and the very places of Gabriel Garcia Moreno's martyrdom. The Preface tells the prophecies made by Our Lady of Good Success that have been fulfilled and shows the miraculous artifacts that still remain. There are magnificent current photos in the back pages. The rest of the book relates the turbulent history of Ecuador as if the Fr. Berthe had been there, and rightly so since he had used so many and such important eyewitness sources. Garcia Moreno is one of our favorite traditional Catholic history books - it exemplifies the life of one who came to live and support the Catholic catechism as a hero. You can buy both the paperback and the hardback Garcia Moreno Biography at Amazon. The book chronicles these events in great detail with authentic contemporary evidence collected by Fr Berthe who lays bare the plot to kill Garcia Moreno: he was assassinated to assuage the vengeful blood lust of local Freemasonic groups who had been continually thwarted by his restoration of Catholic social order in Ecuador. The book is devoted to the remarkable achievements of Garcia Moreno who inherited a country ravaged by revolution, anarchy and corruption. Within the years of his presidency, he reconstructed it along Catholic lines. Almost the first presidential act he performed was to sign a concordat with the Holy See to protect the Church’s privileges in society. This was followed by a new Constitution which made Catholicism the official religion of the State. That is precisely what the Social Kingship of Christ entails, that Christ and the laws of the Church be officially recognized by a nation. We can contrast this situation with the present pluralistic, religiously indifferent society deliberately brought about by the Religious Liberty policy of Vatican II. The result is that today not one nation in the world upholds the Catholic Church officially, which has left the Church with no more status or authority in the public life of any country than other religions or atheism. Garcia Moreno refused to give freedom to evil and to those who wished to attack the Church. He rejected the liberal ideas of the Freemasons who were seeking a complete separation of Church and State, and dedicated Ecuador to the Sacred Heart of Jesus by a government act in 1873. This illustrates the defining feature of his regime: the union of Church and State to guarantee the spiritual and material well being of the people. In the secular sphere, Gabriel Garcia Moreno set Ecuador on the road to prosperity after decades of revolution and corruption that had bankrupted the country. He reduced taxes and established the Mortgage Credit Bank and several Savings Banks to enable commerce and industry to flourish. He developed roads and railways, founded new schools and universities, encouraged scientific research, improved prison conditions and reformed the judiciary and military. This has obviously come to pass as we see that ever since Vatican II the Holy Catholic Church has been afflicted by a crisis of world proportion, heresies abound, the priesthood is wracked by abuses, the light of the Faith is almost extinguished and morals are widely corrupted among Catholics. A Prelate in the 20th century who had the foresight and courage to publicly oppose this wave of apostasy and impiety was Archbishop Lefebvre (1905-1991), Founder of the Society of St Pius X. In his commentary, Fr Kimball brings convincing evidence to establish a close parallel between the fate of Gabriel Garcia Moreno and Archbishop Lefebvre. Both suffered at the hands of Freemasonry, the former shedding his blood for the Faith, the latter undergoing a dry martyrdom through unmerited persecution, ostracism and eventually excommunication. In making this Biography of Gabriel Garcia Moreno easily available to Catholics today, Fr Kimball has performed a double tour de force: he has kept alive the memory of two outstanding Catholic figures who stood against the Church’s enemies and suffered tragic consequences for their pains. It is a task of monumental importance, for the objective of the 19th-century Freemasons has now been achieved – the subversion of the Catholic Church through the adoption of Masonic principles such as equality of religions, the secular state, the destruction of the sacred liturgy and other compromises with worldly values. Both Garcia Moreno and Archbishop Lefebvre regarded these trends with absolute horror and did battle against them. That is why they suffered at the hands of the Church’s enemies. Yet in spite of all this, Freemasonic principles won adherents among the Catholic hierarchy during Vatican II and Liberalism has gained the ascendancy throughout the entire Church. The rest, as they say, is history. The general public, not just Catholics, needs to have access to this Biography of Gabriel Garcia Moreno so as to see the underlying reasons for the ills of modern society. They may then be persuaded to look in the right direction for solutions to seemingly insoluble problems and recognise that true peace can only be achieved with the Kingship of Christ. Fr Kimball certainly deserves credit for his wisdom in publishing historical truths which are an inspiration and prophetic sign for our times. You can buy the book Garcia Moreno at Amazon.com and at Dolorosa Press.com.